Washington Square Press, 9780671028503, 256pp. 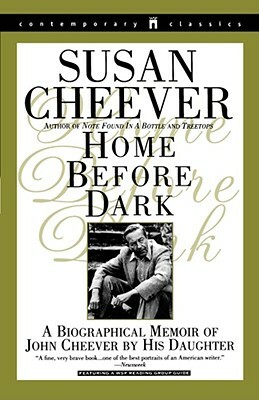 In Home Before Dark, Susan Cheever, daughter of the famously talented writer John Cheever, uses previously unpublished letters, journals, and her own precious memories to create a candid and insightful tribute to her father. While producing some of the most beloved and celebrated American literature of this century, John Cheever wrestled with personal demons that deeply affected his family life as well as his career. In this poignant memoir of a man driven by boundless genius and ambition, Susan Cheever writes with heartwrenching honesty of family life with the father, the writer, and the remarkable man she loved. A fine, very brave book...one of the best portraits of an American writer. Intimate, deeply felt, and often harrowing. Whatever biographers and literary historians of the future make of John Cheever, their ur-text, their indespensible place of beginning will have to be Susan Cheever's beautiful book about her father. One of the most moving and intimate books I have read in years. A restrained and haunting elegy. Home Before Dark clearly demanded more from its author, more courage and force of heart than will be required of any biographer of John Cheever. Out of the pain of real life Susan Cheever has created a document that is ultimately a paean to family love, as humane and bittersweet as the best of her father's work, and as completely believable....her depictions of a family, albeit an extraordinary one, in extremis reads like the best fiction. A powerful book -- beautifully written....I don't know when I have read anything that absorbed me more. An act of love, a compassionate, well-written account not just of the father, or the writer, but of the whole man -- his exhilerations and his darker impulses.